Methigel should not be given to animals with liver or kidney disease. It should not be used with other urinary acidifying products. This product is not intended for use in pregnant or nursing animals. 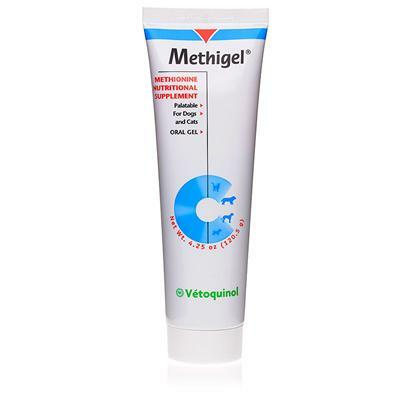 Give Methigel with food, since it may cause gastro-intestinal upset when fed on an empty stomach. Corn Syrup, Malt Syrup, Soybean Oil, DL-Methionine, Cod Liver oil, Cane Molasses, Methylcellulose, Water, Gelatin By-Products, Sodium Benzoate (preservative). Methigel is very palatable. To stimulate taste interest, place a small amount of Methigel on animal's nose or directly into mouth. For cats, depending on the size, 1/2 to 1 teaspoonful is administered daily, and for a dog 1 teaspoonful daily.